Creamy Carrot Soup recipe by Mrs Raghed at DesiRecipes.com. In a large sauce pan bring water to boil. Add all the ingredients, except green onions and milk. 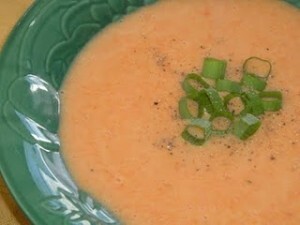 Reduce heat and simmer for 40-45 minutes, or until carrots and onions are very tender. Remove from heat and pour mixture into food processor or blender to puree; return to sauce pan. Reduce to low heat and stir in milk, heating until warm but not boiling. If desired garnish with chopped green onions orchives.